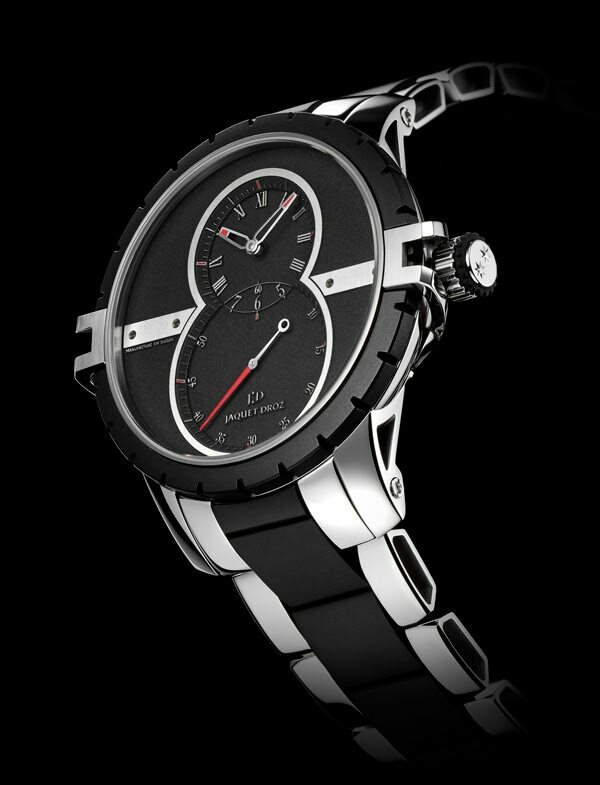 Sporting values may be seen as the latest thing, but Jaquet Droz adopted them from the start. Today, these values are integral to the brand's passion for measuring each moment of passing time and creating fabulous instruments to do it with. Its sports watch (SW) line is composed of timepieces with which house innovation is definitely... in time. Fine materials join forces with natural rubber and Super-LumiNova to produce a striking visual effect, backed by various exciting surprises on the technology front. Setting out to develop the Grande Seconde SW Steel-Rubber, Jaquet Droz mobilized the best that its craftsmanship and philosophy had to offer. Its artisans drew inspiration from the brand's unique heritage and history to produce a futuristic model using the revolutionary design of the Grande Seconde and cutting-edge materials. The goal was to create a remarkable, sleek model featuring marvels of innovation... Mission accomplished! The perfect lines of this dial are obtained in a complex process performed on a single solid block of steel, hollowed to lower the surface level. The elegant balance of the fine-brushed figure eight, the fineness of its spine and the red Super-LumiNova coating on hands and indicators – the red accentuates the depth of the black – all contribute to a refined interplay of volumes, colors and reflections of light. Also hollowed, the plates discreetly stress the dominance of rounded contours. An impression of comfort also prevails: since the bracelet is made of steel – a first for Jaquet Droz – and clad in supple natural rubber, the Grande Seconde SW Steel-Rubber feels surprisingly light and unexpectedly warm. For those who love truly fine watches, this timepiece represents the ultimate in luxury for everyday wear.